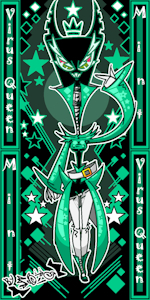 Mint The Shadow Virus Queen! New Sonic comic series to come from IDW! I am a goofball from a white void. I adore crazy-surreal fantasy race girls and other dreamworld realities! Commissions: Ask me and I'll let you know if I'm willing or not. Requests: Unlikely, except for good friends. And only if I feel like it. -thumbs up- Yeup! no prob! I'm alive. Uninstalled Skype a long time ago, sorry. Been disconnecting from the internet to live a more normal life.